The first tournament was held between Stilbaai East and Stilbaai West and the Snymans (of the West), who could call on all of their provincial skills and experience would dominate the results for the early years. The following few years saw Stilbaai Touchies grow in stature and a third region (Jongensfontein) joined in to what was now becoming an annual event. What followed was beyond what any of the organisers could have imagined as word spread and more and more people began to hear of the event. Provincial and National players who holidayed in the area and often stretched their legs provided the growing crowds huge excitement. Players such as Theuns Stoffberg, Rob Louw, Bertie de Wet, Dawie Snyman and Danie Gerber regularly took part. And so the legend of Stilbaai Touchies was born! The next few years saw an influx of teams coming from all parts of the country. 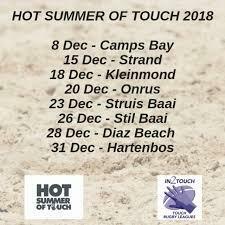 Made up of Social groups of Touch players and more regular players from afar a field as Clifton Beach and Stellenbosch and Pretoria Universities, the standard of touch improved and it wasn't long before things became very competitive. • In the Challenger Section, Open Tournament, Junior Section, Ladies Section and Over 40's Section, a team may consist of 8 players (or less) with a maximum of 4 or 5 players on the field at one time, depending on the size of the beach/fields and the tides. A player may only play for 1 team on a day. If a player is found to be in contravention of this rule, all the teams he/she has played for (on the day) will be disqualified. All Team members must be registered on the team indemnity form and must wear a wristband provided for the entire day's competition. Rules and conditions pertaining to the wristbands will be communicated to teams at the registration or manager meetings at each tournament. Failure to comply with these rules and conditions will see teams being disqualified from the tournament. All decisions are at the discretion of the organisers. All rights reserved! • In 2 Touch Beach Rules will apply. • General competition format is based on teams playing a minimum of 2 games followed by a straight knock-out. Formats will change at the discretion of the organisers depending on the beach lay-out, weather conditions and number of teams. This will be communicated at the captains/managers briefing. • Due to tidal conditions, the tournament may be suspended during the course of a day; all players are to ensure that they remain informed as to the goings on during the day. If they are not present when the tournament resumes, they will forfeit the game. • A central timer and siren will be used to start and finish games. If a team is not present at the siren they will forfeit the game and face automatic elimination. • The organisers reserve the right to shorten or lengthen games to keep to the schedule. • Please refer to the playing rules with regards to the number of players permissible on the field during the second half of games.